Agrepavlis Junior is a beautifully decorated cottage on two floors ideal for a romantic holiday or honeymoon. The open plan kitchen/lounge and dining area leads out onto a lovely veranda with private swimming pool and stunning sea views. Just below the veranda is a curtained outdoor dining area surrounded by Mediterranean trees and shrubs where you may relax and enjoy the superb views over the headland and beyond to the Ionian Islands dotted across the water. Ground Floor: open-plan kitchen fully equipped with fridge/freezer, cooker, microwave, kettle, coffee maker, toaster and all the cooking utilities necessary; living room with comfy sofa which converts into large double sofa bed; flat screen TV, DVD player, CD player and dining area; shower/toilette. Large double bedroom with king size double bed that can be converted into two singles. Separate utility area with washing machine. A/C and insect screens throughout. Stunning, comfy, luxurious and beautiful! We had a great time! The Villa is stunning, comfy, luxurious and beautiful. 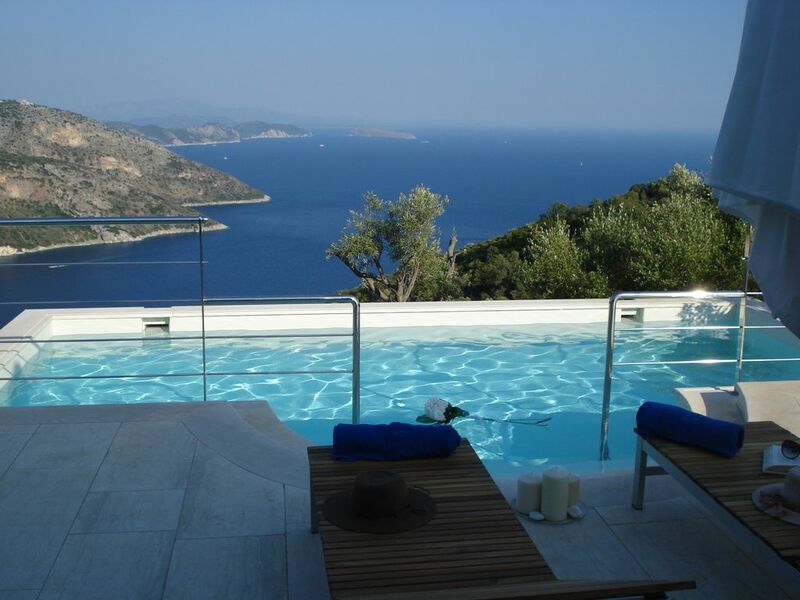 We initially picked the Villa due to the views and private pool, they were amazing. It was a week of paradise, stunning views, great location - easy access via car to numerous beaches, shops etc. Lazy days in the pool listening to relaxing tunes. The host Aris and housekeeper Olga were lovely and always on hand if needed.